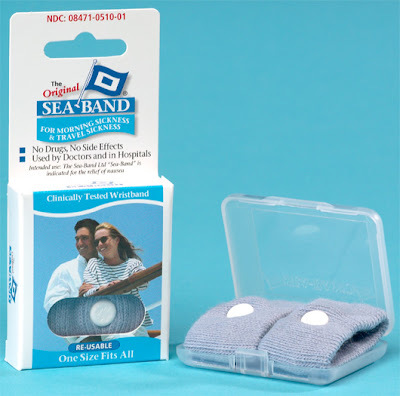 I have read on several blogs of people using these sea bands to deal with morning sickness so today I drove to Wal-greens and picked up a pack. First - let me say that they are especially stylish. I've been wearing them all afternoon and I haven't felt sick. Not sure if it is just a coincidence or not so I'll try them out tomorrow morning for the real test. I would like to say that I have been longing to have morning sickness for a couple of years so I am so thankful to be sick. Not fun - but SOOO worth it! I love the way this looks - I wish I had a couple! I found this one at Touch Stone. And last - you may already know about this but I found a great FREE on-line photo editor that has a lot of neat options including whitening your teeth! :-) You can see my before (bottom pic) and after (top). I chose the 1960's option for the top. I thought it went well with our leis and vacation pic. You will have to go try it out ! I know I'm going to start using it! Thanks for the tips. I've been eyeing your drink dispenser for a while now, so thanks for the link!! I love your drink dispenser too! I also love the black maternity dress you wore at the shower....it is sooo cute and trim and you look great in it! Thank you for all the great tips! I too have been admiring the drink dispenser. So cute, and always great for a shower. I'm hosting a few this fall, so I may need to invest in that! Thanks for the tip about the photo editing website! I've always been too cheap to buy Photo Shop so this will DEFINITELY come in healthy! Are you guys going to find out what you're having or let it be a surprise? Just to let everyone know who has asked about the drink dispenser. I got Kelly's just before Christmas last year at Sam's for $39.00. I knew it was a bargain because I had been looking at them for several months beforeat a MUCH higher price. Oh Kelly...those sea bands are a blast from my morning sickness past! I used them when I was pregnant with my son 12 years ago. They didn't complete cure me, but they certainly took the edge off, and I was grateful for any bit of relief, no matter how small. Thanks for sharing the other links too...I definitely need to check out that photo editing site. You can definitely pull off the sea band look! Have you tried nibbling saltines before you get out of bed... that's what I did. Can't say it was a cure, either, but I think it helped. Love the drink dispenser..thanks for sharing the info! I need to make a purchase. Hope the Sea Band helps. I take them off right before I turn off lamp and put them on before I get out of bed. It does help a lot, but I still have tossed my cookies a few times. I agree while being sick is no fun, it is worth it!!! 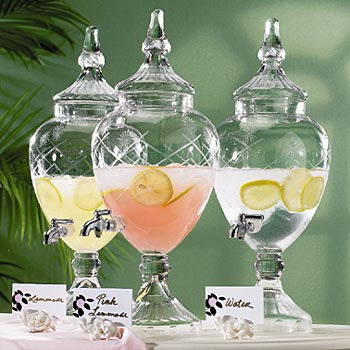 That drink dispenser is just so pretty! I just may ask for one for my birthday next month! I went to the picnik website and that is pretty neat, also! I can't believe choir is over for the summer. I'll miss it! 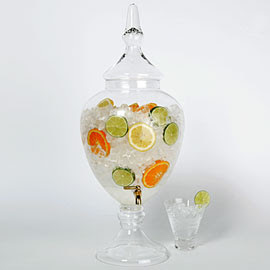 I love the drink dispenser that is really pretty! I've never heard of Sea Bands, but I pray that they work for you! Those drink dispensers are really neat, and I love the 1960s picture. Very retro!! You are the Hostess with The Mostest!!! You looked radiant in the dress you were at the shower!!! And I love the bands!!! They look a light baby blue. Is that a sign you may have a boy. Maybe you should find some pink ones to balance the chances out!!! I wish that I would've known about the wrist things when I was pregnant. NOTHING seemed to help and I was always sick. Those ARE great finds! Thanks for the tip on the drink dispenser - you have no idea how long I have searched for one! I have been everywhere! Those bands were a life saver during my entire pregnancy with Brooks. I remember at the very end, during our birthing classes, having to run out of class b/c I was getting sick and kicking myself for not wearing the bracelets!! I bought one of the drink dispensers from ZG after you told me about them!! Oh they have the drink dispensers at our sam's here! I saw them today. It might not be the exact style but it's similar! I'm so glad the Sea Bond is working for you. I tried and tried them, pushing them down in my pressure points, but they just never quite worked for me. :( They are quite stylish though, huh? I love the drink dispenser. Definitely need one of those! And, thanks for the type on the photo editing. I'm always looking for new ideas! Thanks for the photo tip! With my 3rd little one I was so so so sick. I know the pain all too well, but he has been the joy of my heart and would do it all over again. Your heart is so grateful and I know you feel blessed every day....even with the crud. I've been looking for an Apothecary drink dispenser that's not quite so expensive for some time. I didn't know what I find the one at Sam's was...until now and now they're not carrying them at our Sam's anymore! $49 is nothing compared to what other's are asking for them; even amazon! I like the picture editing site as well. 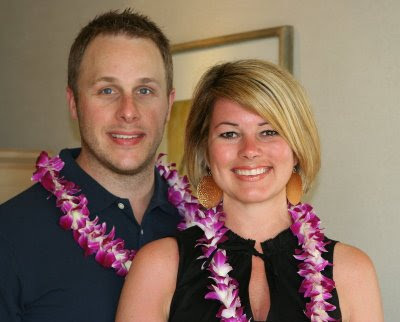 My husband and I love to use Picasa (www.picasa.google.com). Have you tried that one? It's great. We use it ALL the time! Thanks for sharing your great finds!! My "all-day" sickness was so bad with both girls that I had to take Zofran. It truly is a miracle drug and it is safe to use during pregnancy. My sickness lasted til 23 weeks and started up again at the end. You have such a great attitude about it. I didn't:) though I'm so thankful for my 2 girls. I love picnik too and your drink dispenser. So cute! Gotta love those sea bands ;)! I hope that they continue to work for you throughout the morning sickness. I have to tell you last night Vance woke up a few times and I had to rock him back to sleep. I was really tired, but all I think about in those moments is you...your long journey to become pregnant and the joy you are feeling even amongst your pregnancy!! It is a great reminder that every moment with a child is a cherished one. Love the drink despenser! Thank you for letting us know where to find one ;)! I used those Sea Bands when I was pregnant. I am jealous that you found those pretty blue ones because mine were black. I thought they helped me get through the day. I also tried Atomic Fire Balls...this may have helped a little bit. I was advised that the one thing that you could keep down was bananas, but I proved that theory wrong! This time will be past before you know it! Hi Kelly.. I somehow came across your blog and I am so glad I did! I love your tips and great finds! Congrats on your pregnancy.. God is so good!! Not sure what part of AR you live in, but if you ever need maternity or newborn pics.. let me know! Have a blessed day! Great tips! Thanks for sharing. Sorry to hear that you have been dealing with morning sickness. I had it with all 3 babies and in my case it was all day sickness and it last until around week 22 each time. It seems that you have a great attitude about it so I say just treasure each moment. I always heard that a sick Mommy means a happy baby so I just told tried to give it to God. Lemons always seemed to help me - candy, drinks, in water, just anything lemon. Love the drink dispenser. I am going to have to check out those links. Take care and I hope you have a great rest of the week! Love your drink dispenser! A friend told me last year around Christmas that she saw it at Sams and I wish I had gotten it! I'm sorry you dont feel well, just a daily (no fun) reminder of your little miracle! Sam's does still have the drink dispensers. They actually have (or had as of a month or so ago...) 2 different kinds--one was $20, and the other was $30. I got the $20 and love it. I really like the drink dispenser. Your parties always look so sute. You are just darling! Congratulations are your baby!! Bless you! Oh, In hopping around on blogs, I went to your mom's and she is just as darling! Uh, her doggy room! CUTE! P.S. I was at Stein Mart last night and they carry the drink dispenser ;)! I have GOT to buy one of those dispensers!! Oh, I tried those sea bands but they didn't do anything for me--I hope they help you feel better!